Flemish thespian Matthias Schoenaerts (Rust & Bone, A Bigger Splash) excels in what appears to be a generic low-budgeter, but may, in fact, be a convict spin on The Horse Whisperer. 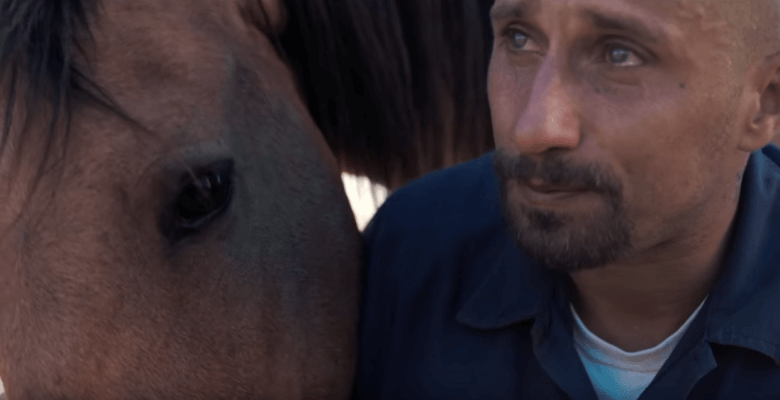 Actress turned filmmaker Laure de Clermont-Tonnerre works adeptly from an actual inmate program in a beautifully lensed The Mustang to harness the internally roiling head-shaved Roman (Schoenaerts) who finds an untamed equine equal. Connie Britton’s prison psychologist is told by someone in need of rehab and ultimately redemption that he’s “not good with people.” From shoveling manure in the stalls, he’ll become attached to the steed inside of a secured barn. He’ll be selected in the facility to work with a captured titular horse (because of a threatening high population in the wild to be in ‘shape’ for public auction) he’ll call Marquis from some of his incarcerated reading. Clermont-Tonnerre offers a sparseness to what is stern and unyielding, thus following an honest, unsentimental path with a ketamine, drug sting hiccup along the way. It’s a striking expansion of similar themes from her 2014 short feature Rabbit which dealt with a female inmate. A visceral power is evident between a noticeably curt Roman and Marquis that can be discomfiting as well as tender. Roman doesn’t progress in the expected manner and the coverage of the prison system can be startling accurate for those connected to the corrections field. While Schoenaerts has a crackerjack way of expressing the taut character which moves The Mustang to an indelible concluding shot, a classy Clermont-Tonnerre lets his shine with solid back-up. That includes Jason Mitchell’s fellow trainer Henry, Gideon Adlon as a hesitant, estranged daughter, and a no-nonsense program director Myles, a pungently grizzled (always welcome) Bruce Dern. MPAA Rating: Rated R for language, some violence and drug content.